The SOG GSP-21 Green Handle SOGzilla Knife knife has a quality stainless steel blade that won’t lose its edge very easily and it weighs only 4.8oz. While it is a large sized knife with a total open length a little more then 8-1/2″ inches long, it managed to keep the weight off by having its widest section be only 3/8 of an inch thick. With its thin profile, it carries very well and discreetly with the bayonet style pocket clip making it perfect for every day carry. The SOG GSP-21 Green Handle SOGzilla arrived in a slim cardboard box along with a user manual and warranty card. Our initial reaction to this knife is that it is almost leaf-like in its closed shape – and not much thicker for that matter. When you flick the blade open by pressing your thumb against the hole cutout in the blade, however, the overall open size of the knife is surprising. At 3.8″ long, the blade is a big-bodied modified sheepsfoot and curves in such a way put the blade and handle in a nice arch shape when open. The blade is made of 8Cr13MoV stainless steel which is a higher quality Chinese-produced stainless steel that has a high carbon content. For comparison sake, this stainless steel is very similar in its primary characteristics to the Aichi Steel Corporation AUS-8, Hitachi Metals ATS34 or Crucible Material Corporation154CM stainless steels which are all type of stainless steels that are used in quality pocket knives. 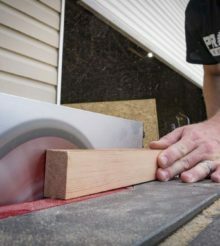 The final hardness of the blade is tempered to a Rockwell hardness of 57-58 which is a decent range to offer good edge retention and yet make it easy to resharpen. The SOGzilla is available with a serrated edge or straight edge, of which we received the straight edge for this review. We actually prefer this style better for its long term use because of how easy it is to resharpen the blade (over the serrated style). The dual directional nonslip grip is made of glass-reinforced nylon (GRN) which is almost indestructible and has finger grooves on each side of the handle to ensure a good hold. To provide durability and minimize blade to handle flexing there are stainless steel liners inside the grip. The liners are not the full size of the handle but rather are hidden inside and extend about 2/3rds of the way down the inside of the handle. We suspect this was a design element that kept the knife strong yet lightweight. The handle is held together by four round head star hex screws. At the end of the handle, by the reversible clip, is a lanyard hole should you need to add one. The low-carry, “bayonet style” (as SOG calls it) pocket clip can easily be reversed to the opposite side if you want to carry it in your left pocket, or it can be removed altogether. Something else that we noticed was that, with the location of the clip on the end of the handle, when you pull it out of your pocket, the knife is already oriented for the quickest opening of the blade (unlike some other designs that put the clip on the blade end of the handle). For a locking mechanism, this knife has the tried and true lock back design (mounted mid-handle instead of at the bottom) that is ergonomic and simply works every time. The SOG GSP-21 SOGzilla has been a constant companion in my pocket for the last couple of weeks. Really the best way to test and review this type of tool is to have it with you so that when various opportunities arise, you have it in hand. Around our shop there is always use for a pocket knife. The first major observation is that the knife fits very well clipped into the front right pocket of my pants. Even with its nearly 5″ long closed length, it was almost undetectable thanks its thin, lightweight profile. We especially liked the low-carry clip because it was the only part visible when carrying the knife and it made it so that the knife was always ready for use at the top of our pocket. While the SOGzilla does not feature any kind of assisted opening, we found that the blade could be deployed and closed quickly with one hand if using the correct technique (kind of a quick pinch and flick with the thumb and forefinger). We do question the design of the cut into the thumb hole on the blade as this the only feature on the knife that can get snagged on something when pulling it out of your pocket. The lock is very solid and there is no flexing or looseness in any way even after using it for a few weeks. Most of our day-to-day adventurers involved cutting tape, cardboard, black plastic, sharpening pencils and just having fun flicking it open. The blade has kept up very well and is still very sharp while the blade surface finish is just as nice as it was when we first took the knife out of the box. While the SOG GSP-21 Green Handle SOGzilla Knife is a design that might not be for everyone, we found that even given its large size, it makes for a good choice for an everyday carry. SOG managed to offer a full sized knife in a thin and lightweight package. With a fully ambidextrous thumb hole in the blade for manual opening and a sturdy lock back design, this no frills pocket knife is designed to offer long term dependability. For our Performance rating, we scored this knife a 6/10 since it is balanced well and still has very a thin profile with a good edge. For our Value rating, we scored the SOG GSP-21 Green Handle SOGzilla Knife an above average 7/10 since it offers a sturdy knife at a reasonable price.